Eco-Building & Forestry, LLC. | EPS Foam: The Gift that Keeps on Giving . . . . . . Sigh! EPS Foam: The Gift that Keeps on Giving . . . . . . Sigh! Don’t you hate the waste regarding packaging? 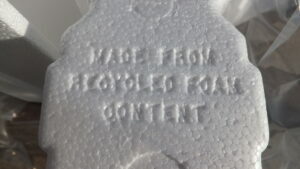 While cardboard and some wrapping paper is reusable and recyclable in many ways, foam is often not so easy. Most foam and plastic packing materials end up in the landfill or worse yet in our oceans. Part of a sustainable property is finding ways to reuse things that you end up with. Expanded Polystyrene Foam (EPS) is one of those things that show up in abundance, especially around the holidays. It is used for packing many things, is light and cheap to produce. You can recognize EPS by the small balls of compressed foam that make up this material. EPS takes up space in landfills, lasts forever and is not easy to re-use on your own property. 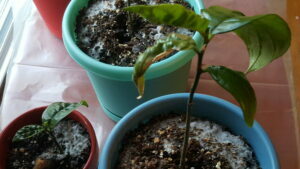 Our friend Eric reused our EPS wine shipping carton to fly these jack fruit trees to Cameroon. What Do You Do All Winter? Weather Forecasting: Is it All About the Money? Fall: Get Your Pond Ready Now For Winter Aeration! Sustainable landscapes that fit your lifestyle. Serving Wausau, Stevens Point and all of Central Wisconsin.